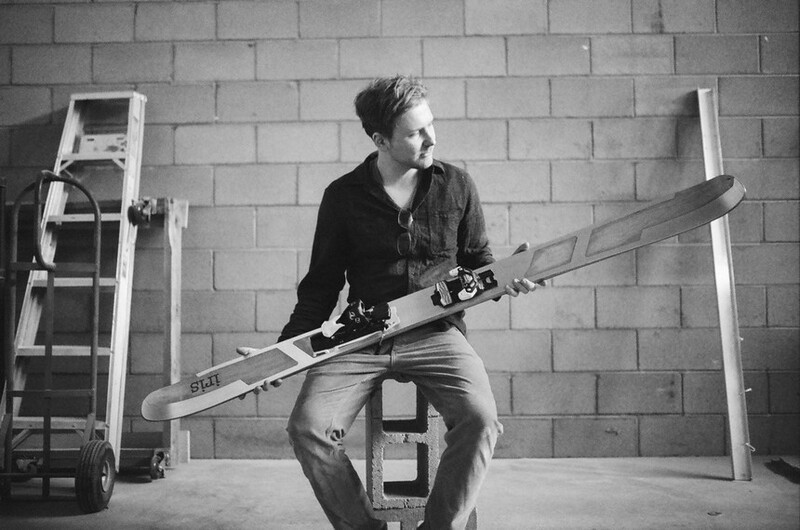 Eric Hegreness wanted a fresh take on ski manufacturing, so he decided to start a ski company and do it himself. Dane Cronin photo. A few years ago, after working in ski shops for most of his life, Eric Hegreness had enough and decided he wanted to start fresh. To him, the ski industry had become stale, with the same “trends” appearing in every manufacturer’s lineup, but everything skied and looked the same. Wanting something different, Hegreness built a workshop in a garage to start pressing his own skis and make a mark on the ski industry with an eye towards craftsmanship and hand-built skis. Nearly a decade later, Iris Skis was born out of that idea, and Hegreness is now growing his brand. 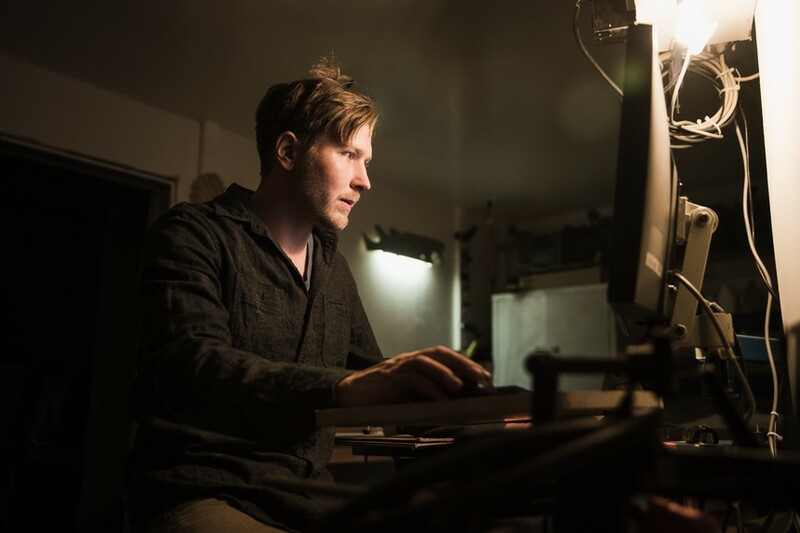 With a workshop and manufacturing facility based out of a tiny warehouse in Boulder, Colorado, Hegreness is refining his craft. It may sound like the dream come true, but it is not as easy as it looks. Hegreness balances his Iris Skis project with a full-time day job in the aerospace industry, manufacturing optics for things like missile defense. However, his commitment to building skis his own way is unwavering, and he plans to keep developing his passion project further. Ohio might not be the first place that comes to mind when you think of a ski designer's origins, but Hegreness’s upbringing in the molehills of the Midwest is integral to his vision for the ski industry. He grew up riding tiny hills with the likes of Brody Leven, Matt Heffernan, and Kyle Decker, investing his time in skiing in any way he could find. For years after college, Hegreness worked as a ski tech in one of Colorado’s busiest ski shops, cranking out over 100 pairs of skis a day by hand and learning everything he could about ski design. Hegreness designed and built his entire manufacturing process and facility himself. Dane Cronin photo. Working in a shop gave him plenty of time to think about what he would do to change the way skis are manufactured and sold. In 2012, he was lucky enough to find a veritable treasure trove of old ski building materials, and immediately started messing around pressing his own skis. 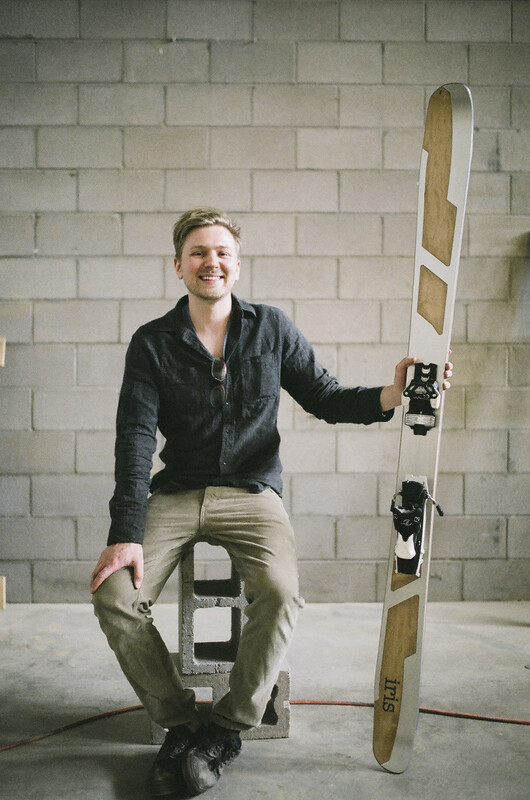 “Actual skis were hard to make at first, because I had no idea what I was doing, so for the first few years it was all just skate decks,” said Hegreness. 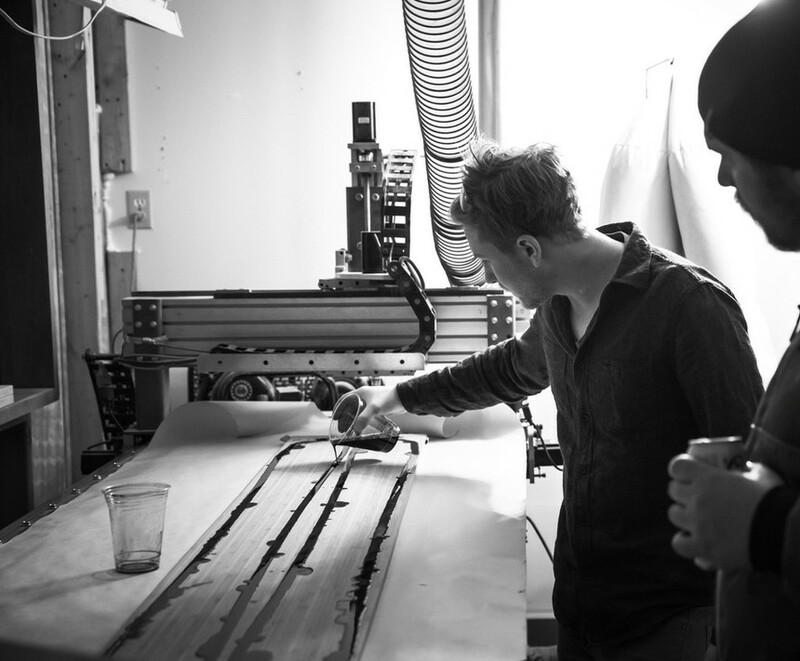 Building skis requires more than just a press, so he built a CNC router from scratch to cut out ski cores and topsheets. The main problem? Space. The press was 15 feet long and required so much power that he wasn’t sure anyone would rent him a spot for it. However, after a few years of figuring out what he was doing, Iris Skis was born in a rented garage in downtown Boulder. Hegreness was forced to leave the garage in 2015 but found a much larger facility to use in a former brewery in East Boulder. Here, he was finally able to refine his manufacturing process with plenty of space to keep his equipment and experiment with different techniques and machines. However, this past fall, he was forced to move yet again. 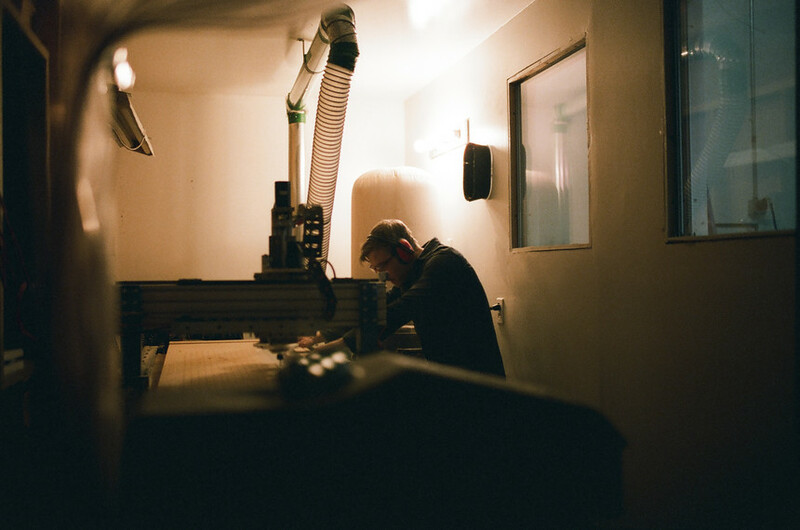 Austin Porzak looks on as Hegreness lays down base material for his new pair of sticks. Dane Cronin photo. The pain of being forced to move again and again has not fazed Hegreness. Brushing it off as a mere inconvenience, he decided to push further into the industry and sponsor two ambassadors: locals Austin Porzak and Dan Sohner, who had the ambitious goal to ski every single summit in Colorado’s Rocky Mountain National Park. Hegreness felt the need to get someone onboard who had a story to tell, not just some kid who throws big tricks in the park. By new ski model, he means the CX105, a very unique-looking pair of planks that feature a combined metal and wood topsheet and will certainly raise eyebrows on the skintrack or in the liftline. It is not necessarily a touring ski but can certainly hold its own in the category. Balancing a day job and building skis requires some late nights in the shop. Dane Cronin photo. Even with picking up athletes and growing the business, Hegreness realizes that Iris Skis stills has a long way to go. While the day job pays the bills, he knows he needs to find a way to dedicate more time to ski building to make it all work. And the abysmal 2017-2018 Colorado ski season has not helped. With a pair of his new CX105's and facing many unforeseen challenges, Hegreness does not plan on stopping anytime soon. Dane Cronin photo. However, he notices interest is picking up fast, with ski demo tours reaching out and offering spots to demo his skis. Real skiers are looking at them, riding them, and buying them. So what’s next? Hegreness’s persistence and dedication to his passion project is driving him to keep plugging away. For next season, he plans to update a few more parts to his machinery, and finally dive full-time into his dream. Expect to see a pair of those silver sticks in a liftline or skintrack near you. 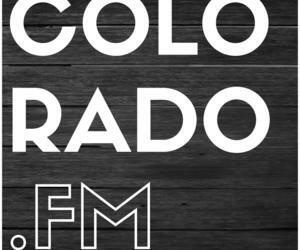 Had a chance to speak with Eric from Iris Skis on the Colorado.FM podcast. Really cool local guy making an amazing product. Great to speak with him.